I Only Love You Because I Have To » Blog Archive » What I Did On My Summer Vacation…And Can I Get a Do-Over? What I Did On My Summer Vacation…And Can I Get a Do-Over? My brother parked the car, and his wife and I ran as fast as we could to make the ferry before it departed. Soon I was standing on the back deck of the Grey Lady as it churned up the dark waters off Hyannis Port en route to Nantucket. It was June, but the sky was the color of smudged charcoal, and the wind whipped our hair into a frenzy as we cut through the choppy waves. Most passengers sought refuge out of the frigid salt spray, but I stood on the deck, impervious to the chill as I watched the foamy wake trailing behind. Two days prior, two faint pink lines had appeared on a pregnancy test. And now I was here, on the sea—slightly nauseated and alone with my secret—some 1,200 miles from home. Once we got to the island, the clouds blew away like smoke, and the sun began to warm the streets. Nantucket dripped with charm. We traversed quaint cobblestone streets, snapped photos of rose-draped white picket fences and gray-shingled cottages. We walked out to a lighthouse and dipped our feet in the frigid Atlantic. And when we were hungry, we dined on tiny, delicate cherrystone clams and lobster rolls. The dreaminess continued as I fingered tiny, infant-size Nantucket shirts, children’s storybooks. I walked through the enchanted town, eyeing unsuspecting tourists. Because—right then—this tiny, two-week-old cluster of cells was beating into existence. And the new world I was experiencing through pregnancy-colored glasses (think beer goggles but with a hangover) was poetic and lovely. And that evening, when we departed Nantucket Sound, a few people joined me on deck, watching the lighthouse throw light beams across the water. A man stood next to me, fished around in his pocket and came up with a penny. “You’re supposed to throw a penny off the boat to ensure your return to the island,” he told me. I looked at him skeptically. “Is that something islanders tell tourists?” I asked. “No, it’s real,” he said, convincingly flipping his penny into the icy depths below. I pulled a penny out and did the same. I also wished for a healthy, viable pregnancy. I got that wish, and for that I’m grateful. But, all things being equal now, I’d like to tack on one more wish: One. More. Relaxing. Vacation. Fast-forward three years. That tiny speck of cells is now a very tall, lithe two-year-old with curly hair the color of caramel. And he’s throwing his body again and again into the salty surf of the beach. He can’t swim. But he flings himself into the waves as my husband grabs his hands, his arms, his pants in an effort to save the toddler who has no idea he’s being saved. I sit, surveying all this on a warm patch of sand, my nine-month-old daughter wiggling impatiently in my lap as sand blows in our eyes and sticks in our mouths. 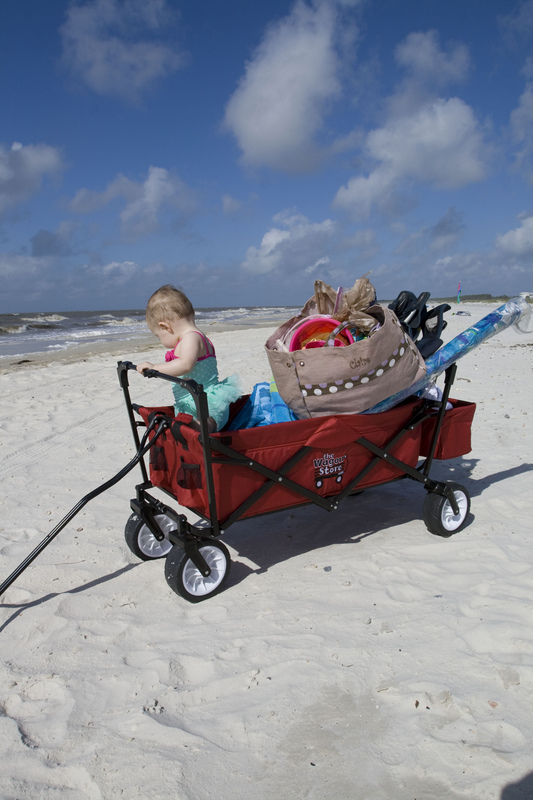 I put her in the wagon we carried down two flights of stairs and both pushed through the sand just to get all our crap onto the beach. 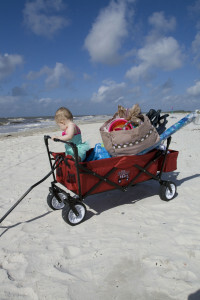 But she tries to fling herself out of the wagon, mimicking her wild brother a few yards away. I yell into the wind at my son, but if he hears it, he ignores it, my advice blowing away. We manage 20 minutes on the beach, coaxing a screaming, kicking toddler back to the boardwalk so we can then again lug the wagon—packed with chairs, buckets, towels, bottles, sippy cups—up two flights of stairs while each of us holds a small child in one arm. When I grew tired in Nantucket, I curled up in a daybed and napped until the late-afternoon sun woke me. But here in Florida, I have yet to get to sleep. We are tired, my husband and I. More tired than we ever thought possible. And we’re road-weary veterans of bottles and breastfeeding and projectile poop and vomiting. We’ve done it all. We deserve a vacation, damn it. And we intend to take one. But at 1 a.m., when our two babies begin screaming, I try to will myself back on the deck of the Grey Lady, basking in the glow of early pregnancy with no responsibilities. It doesn’t work. Instead, I lie in bed—alone, my husband on the sofa with the dog; my daughter commandeering the master bedroom; my son in the bed across from me—mentally flipping a penny into the gray water below: Can I get a do-over?? A relaxing vacation perhaps? And then I think back to those two faint lines running across the pregnancy test, that pink symbol of a perfection I hadn’t previously known existed. In that moment and in the moments standing aboard a Nantucket-bound ferry, I was brimming with the brand of idealism not yet tainted by the realities of motherhood. Will I ever again be able to nap for hours on end in a sun-drenched room unpunctuated with baby cries? Will I ever know the pleasures of a dog-eared beach read with only the sound of waves in the background? Will I ever get to that hard-earned point in the distance? And when/if so, will I miss this—the chaotic nights, the spilled sippy cups, the never-ending exhaustion? For now, those are questions I don’t have the time or energy to ponder. Instead, I will myself out of bed to cajole a wailing infant … and pour myself a large cup of coffee….